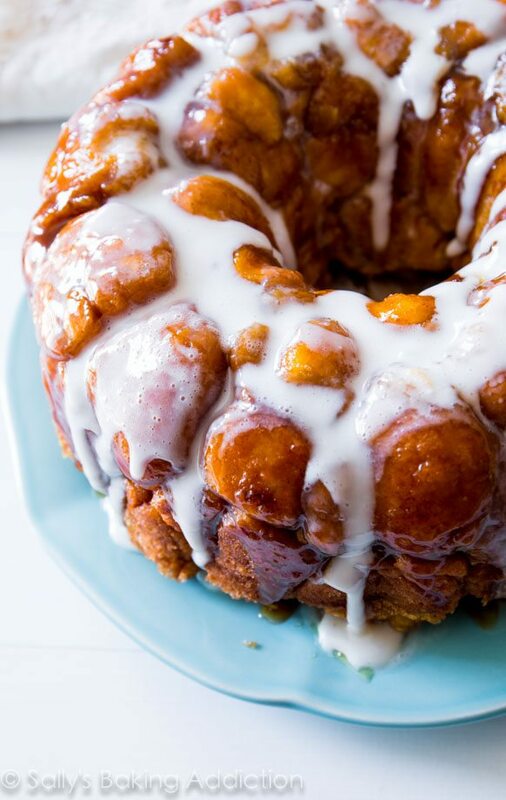 Apple Fritter Monkey Bread. Each little dough chunk is filled with apple turnover filling, which makes them so moist and melt-in-your-mouth good. You can easily adapt this idea to your favorite pie filling. 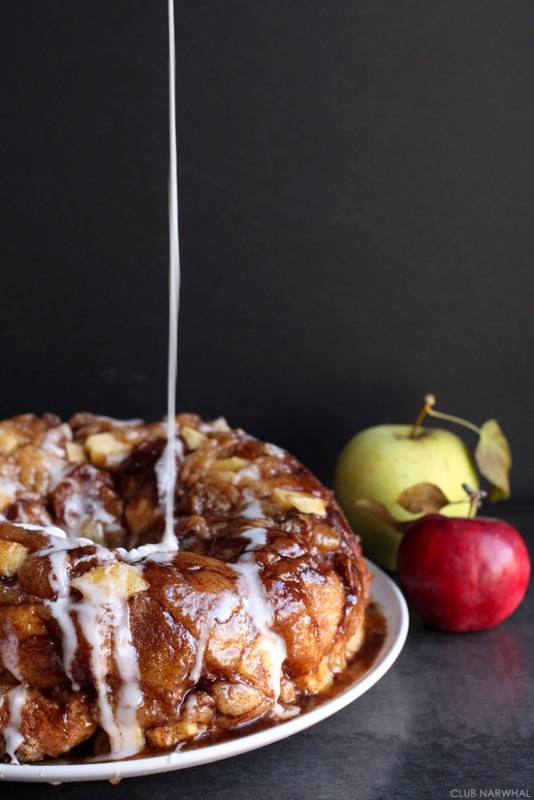 Cherry fritter monkey bread would be my choice. All you do is flatten balls of dough, place a tablespoon of filling on each one; pinch closed and roll in melted butter and sugar, then place in your tube pan to raise for about 45 minutes. When proofed, bake in a 350°F oven for 35 to 40 minutes. 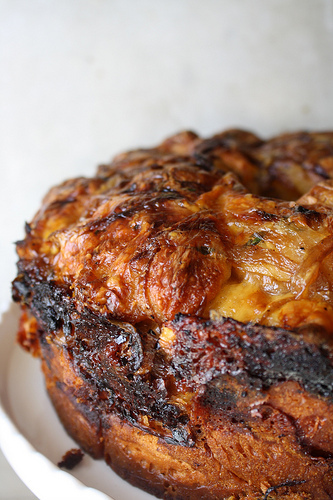 Finish the baked bread with a good covering of vanilla glaze (recipe below). 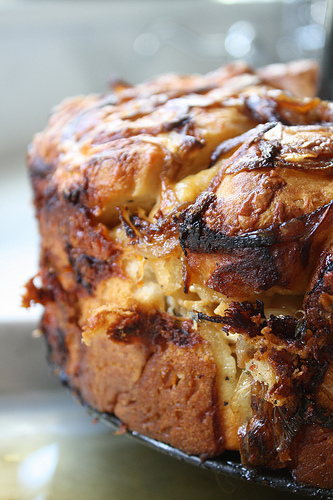 Cinnamon Roll Monkey Bread. This version, courtesy of Sally’s Baking Addiction (www.sallysbakingaddiction.com) is completely smothered with a brown sugar sauce before baking and then topped with vanilla glaze. The approach is the same as for the Apple Fritter Bread. Mix up a batch of your favorite sweet roll dough, form it into balls, and then coat each ball in a mixture of melted unsalted butter, sugar, and, ground cinnamon (to taste). Place these balls in a well-oiled tube pan and then pour a brown sugar syrup over the balls. This syrup is simply more melted butter (about ½ cup), brown sugar (about ¾ cup) and vanilla. Sally suggests 1 teaspoon of vanilla but I use a full tablespoon instead. Let the dough raise for 45 minutes (or until doubled) and then bake this at 350°F for 30 to 35 minutes. You may need to cover the top loosely with foil if it starts to brown too quickly. Once baked, let sit for about 10 minutes, then turn out onto a plate or platter and pour a vanilla glaze (recipe below) over your bread. 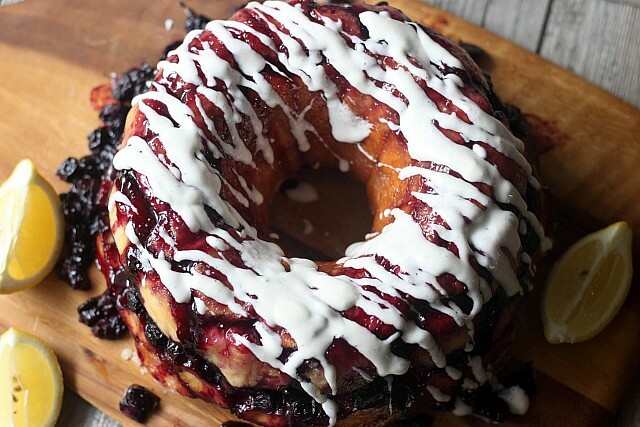 Blueberry Lemon Monkey Bread. This bread has a heavy dose of macerated blueberries, zesty bright lemon, and sweet cream cheese icing. But you could also finish it off with the basic vanilla glaze if you’re in a hurry. We thank the great site, Mind Over Batter (www.mind-over-batter.com) for this wonderful idea. Again, start with your favorite sweet roll dough recipe and form into balls (golf ball size is perfect). Roll each ball in melted butter and lots of sugar. Place them in a well-oiled tube pan. Next you’ll cover the balls with macerated blueberries. This is 1 pint of berries mixed with 1 zested lemon and sugar (about 1/3 cup). Let this sit for a while to allow the juices from the berries to escape. Once the berries have gotten juicy, pour this over your dough balls, cover the pan with plastic and let the dough rise for about 45 minutes. Bake at 350°F for 35 to 40 minutes. Let it sit for about 5 or 10 minutes, then turn the bread out on to a plate or platter and cover with a cream cheese glaze or the basic vanilla glaze (recipe below). 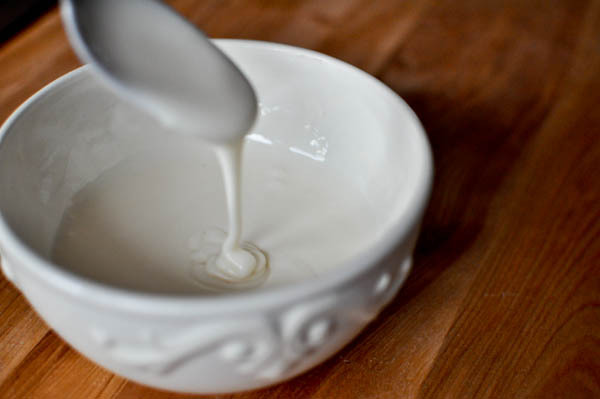 For a cream cheese glaze, just blend cream cheese (at room temperature) with some sugar and vanilla (all to taste). 1) Preheat the oven to 350°F. Prepare an angel food cake pan with a removable bottom and set it on top of a rimmed sheet pan. 2) In a large pan, add 2 tablespoons of butter and the thinly sliced onion. Sprinkle with salt and cook over medium heat until the onion slices begin to brown, about 5 minutes. 6) Brush the inside of the pan lightly with the melted butter, then begin to add about 1/3 of the dough balls about another 5 minutes. Set aside.